The Darley Awards were founded in 1987 to honor the best in Arabian horse racing. This distinguished ceremony recognizes the most outstanding racehorses, jockeys, owners, trainers and breeders of the Arabian community. Award ceremonies present an opportunity for those involved in Arabian racing to celebrate its virtues and award its best. The Darley Committee selects the nominees and a Voting Academy decides the winners. The Voting Academy is made up of knowledgeable individuals within the racing community. For more information on the Darley Awards and racing weekend, please contact the The Arabian Racing Cup. For other questions please contact Arabian Jockey Club at (303) 696-4523. With the exception of the Arabian Cup Championships, no other event brings as much attention to Arabian Racing as the Darleys. 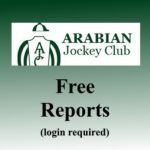 For registration, a schedule for The Darley Awards and to view winners, visit The Arabian Racing Cup.